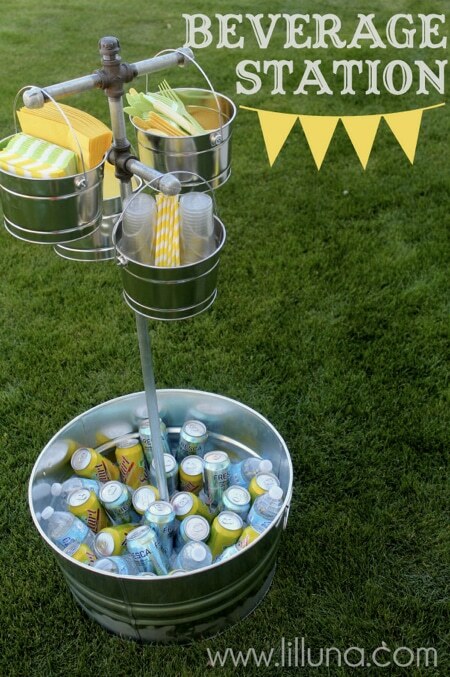 This DIY drink station has so many possibilities for entertaining guests. It can be used inside and outside for family and friend get-togethers, holiday parties, birthday parties, picnics, BBQs, weddings, etc. Once made, it can be used over and over again. Change the color scheme of the accessories and you’ll have an entirely different and unique look for each occasion. To make this drink station you’ll need a beverage tub, pails, welding glue, sandpaper, and galvanized pipes, connectors and end caps. It’s an easy two-day project only because you have allow the glue to dry for several hours/over night.